Here is an item from a relative of mine that it seems some of you may enjoy. It is 48 inches in length and all original. I do not know if it still fires properly. It says W. Richards on it. I believe it stands for Wesley Richards. 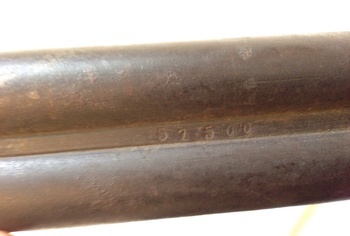 There is also a serial number of 57500 stamped into the underside of the barrel. There are no other markings that I can see. I believe it is from the early 1800's. The gun maker is based out of Birmingham, England, and still manufacturers guns to this day. Was it used in the war of 1812? You tell me. :) I believe it is a rare/scarce item. I am not a gun person but I did research one of these after a relative passed away. The lack of markings after the name indicates it is an inexpensive import. The lack of the name of the country it was imported from adds to the problem. Reproductions bearing these markings were produced well into the 1950's. The lack of markings was intentional so the weapon would clear customs import without additional taxes. If you research it you will find the company has a colorful and somewhat under the table approach to marketing. Thank you for the information fhrjr2. I did some research on the item and yes. W. Richards is a name used on replicas of this sort of item. It would explain a great deal if I were able to connect the serial number to a date or specific location it was made. Here is a link that will give you a date if it is a Wesley Richards. Unfortunately it did not show records when I typed in 57500. Shotgun it is, but flintlock - it ain't! Thank you so much pw. So if it ain't flintlock what is it blunder?!??! 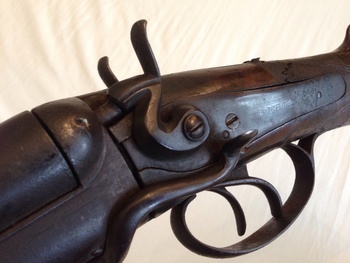 Just a rabbit eared double barrel that the breech opens for loading cartridges. Here is a link showing a flintlock & how it works. Thank you for the comments blunder and pw. So you guys are saying this was never made with the intention of being able to be fired? Is it even that old? It seems to be. Thank you for the comments and feedback igottaold. Have an awesome evening my friend! lever" barrel release latch where yours has a "side lever" barrel release latch. The side lever preceded the top lever. In your first photo, it appears there is a large crack in the stock behind the hammers. This probably has damascus barrels for use of Black Powder Loaded Shells only. Electo. The lever on the lft. side should make the breech open (the barrels swing down) for loading shotgun cartridges (shells). I see no appearance of Damascus in the barrels but agree that it is probably for black powder. Until it is known for sure, don't try to fire it with modern shells as it could blow-up around the breech. Needs to be checked closely, but by the pics, I would just hang it on the wall. It is a firing shotgun and NOT a replica. Buss had it correct. There was a substantial use of shotguns by the military prior to Viet Nam. I don't agree with the replica idea. People don't replicate things of no extra value except in plastic for such junk as "pirate pistols" etc.. This appears real but just needs to be researched more, and that's not my job. Do your research & let us know. That breech locking system would probably put it in the era of the change from Black powder to smokeless & that makes a lot of diff. in breech pressures. Just hang it on the wall. The lever on the left does make the breech open. It is late 19th century. scottvez. Blunder. I commend you both for the information provided. It is greatly appreciated. I have great respect and appreciation for both of you. Glad to help. I would echo with buss' caution about shooting. I wouldn't try a modern shotgun shell in it. Looks like a nice wall hanger. 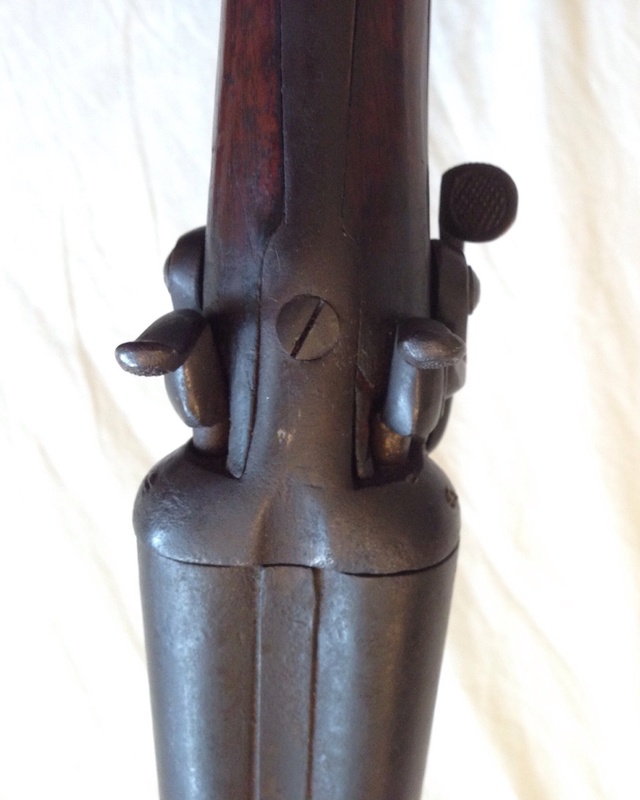 I've never heard of a replica that you could chamber a shell in & has a functional firing pin. Again, why would somebody replicate anything that isn't worth replicating & lose money doing it? Use some common sense! It's "real". Just don't try to shoot it without a full reliable inspection. Your assessment of antique firearms is off. Research and handling of these goes a long way in assisting in correctly identifying. Okay. Thanks again blunder. I will be very careful with this item and continue my research on it. All of you have been a tremendous help and once again I am grateful and appreciative for what you've done. The firepins seem functional to me from what I can tell. Also there is a large crack in the stock behind the hammers as you noticed pw. Yeah it breeches igotta. Pushing down on the lever on the left releases the barrels allowing them to swing down. I have never focused on shotguns, tobacco; but I do believe that there are many spurious examples with the "Richards" name. Other than saying it is an antique shotgun, I wouldn't want to commit to a maker. By the way-- the screw on the top mentioned by recordplayer, is typical in most 19th century firearms and NOT and indicator of a replica. That same screw is found on muzzle loading US military firearms of the 19th century. That is not a nonfiring replica. The nonfiring replica all have short barrels and the fact that the two guns are not exact does not mean one is a nonfiring replica. recordplayer-- in addition to researching, reading about and HANDLING antique guns, you might want to take a look at the forum rules to ensure your comments are in compliance. Scott, did you get a "point" deducted? Never heard of this point system. Must be new or I would have been banned ages ago!!! Remember Staff, I luv you, no matter what everybody else says about you! LOL!!! How many points do I have against me? Don't know anything about points, but did find the guesses and language annoying! I have a shotgun exactly like this one. Did you ever discover its age or worth? Remove the barrels & see if it is stamped W.F. or W.F.C. I see the number 9121 below the firing pins where the barrels sit. Some symbols. No W.F. or W.F.C., yet. 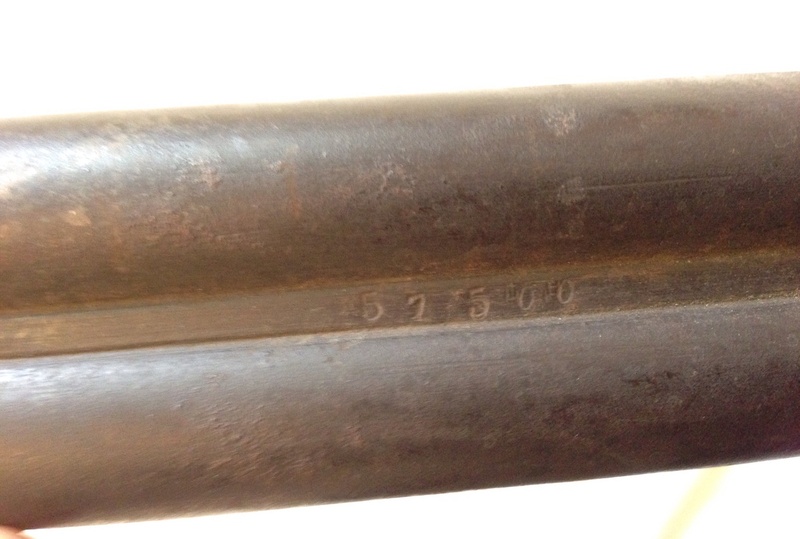 The bottom of the barrels says 184, LG, E LG in an oval, and some other symbols. W. Richards is on each side of the stock plates behind the hammers. It was my fathers and was passed to me when he died. have no idea where he got it. Any help would be greatly appreciated. Where exactly would the WF be found? Too bad. A Wells Fargo stamping would make the value jump ! LOL ! The LG & ELG are Belgium proof marks. I have this gun and am looking under the barrel. The letters appear to be C.R and a partial C, almost like a curved L. Above it facing the other direction are those letters repeated. The barrels are numbered 11 and 12. Anyone have an idea what those letters mean? Nice shotgun love the look but agree I wouldn't want to be the first to fire it. The lesson? if you get it working never pull the front trigger first or use two fingers. As any good gunsmith will tell you: Put it in an old tire, put a 5 lb bag on the over the top of the barrels, tie a 1/4 mi. string to the trigger and pull from the end of the string. Looks like our long gone research expert was here. No more Barney Google. Not missed by me! His threatening posts were too much for even CW to tolerate! You were involved-- it was a few years ago. The guy was a self proclaimed research expert. He had little/ no knowledge and would post what he found online-- which was often incorrect. When challenged on his postings he would threaten folks. I remember the one. Guess his parents never got married.